Enchanted is WBN’s Book of the Day! World Book Night might not be here until April 23rd…but that doesn’t mean the World Book Night folks can’t celebrate every day until then! 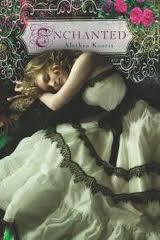 Today, Enchanted has been selected as the Book of the Day. All day today on the WBN Facebook page and the WBN Twitter account (@wbnamerica / #BookOfTheDay), we will be celebrating ENCHANTED. Stop by, spread the love, share your favorite quotes, and find out some fun facts about ENCHANTED (and Alethea!) that you might not have already known. Not available tomorrow? Worry not! The week of January 24th, ENCHANTED will be World Book Night’s #FridayReads. They will be reading and discussing the book all week long. You have PLENTY of time to gear up for that one. This entry was written by Princess Alethea and posted on November 26, 2013 at 7:00 am and filed under Enchanted. Bookmark the permalink. Follow any comments here with the RSS feed for this post.